Sports card packs have always offered the “chase card” aspect to collectors and non-collectors alike. You always wanted to find that card of your favorite player or one of the few real stars in the game. There was always a chance your favorite would be in that unopened pack sitting in the box on the counter of your local convenience store! When you didn’t find that desired card in one pack, you might swear that you’d never buy another pack again, but you always came back for more. When you found the coveted card, it usually was placed in a special spot I your room…until your interest in sports cards was replaced by…other things in life. All the other cards? Their fate was less honorable. We’d buy them, fold them, put them in our bicycle spokes to make noise. We’d even bring stacks to complete in tossing them against the wall, with the card closest to the wall winning all the other cards thrown at the same turn. Becoming an expert in throwing a “leaner” (the leaner leaned up against the wall and was nearly impossible to beat) was a sure way to win a stack of cards every game. Sometimes, you found your favorite player this way too! All this abuse of sports cards, mostly baseball, was a sure way to ensure that few descent cards survived in good condition, thereby eventually making those few older cards in good condition, collectible. There are many similarities with old comics, all except for throwing them up against the wall…at least I didn’t do that one. All this abuse of sports cards began to change in the mid 1980s. A group of collectors made news by traveling around the continent, buying up collections and discovering that certain cards were almost impossible to find, especially in “mint” condition. All of a sudden, people were digging up their old card collections of their youth to see what they had. 99% of us were dismayed by how beat up our old collections were. 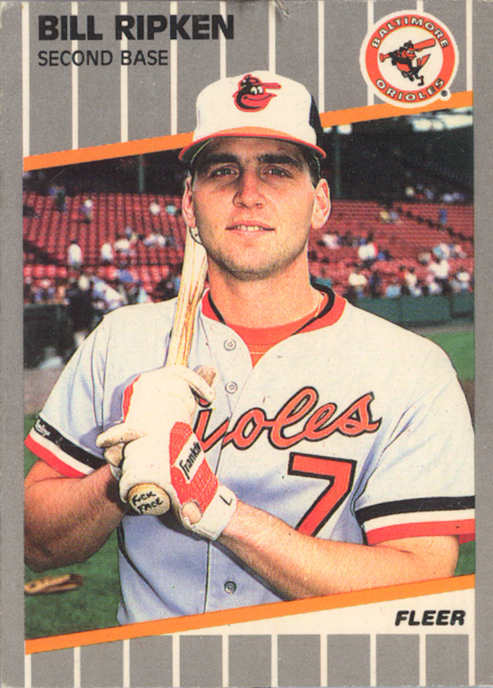 The “chase card” aspect of the sports card industry garnered a lot of attention with the printing of the most famous “error” card in the history of baseball cards, the 1989 Fleer Billy Ripken “F#@k Face” card. Anyone interested, especially the kids, went crazy trying to find this card. Fleer 1899 unopened packs were fetching $10-15 each, just on the possibility that you might find the famous Billy Ripken “error” card. Here is what the fuss was all about. Coincidentally, in the same year, a new company “Upper Deck” produced their very first baseball card set. Marketed as a premium set targeting for the first time, adult collectors, card packs were $1 each, double the usual 50 cents and contained half the usual number of cards. The cards were beautifully done and collectors went nuts snapping them up, while the kids stayed away due to the 4x increase in cost per card. Things moved quickly from there, with the kids being entirely squeezed out of the sports card market shortly after. In 1990, Upper Deck sought to capitalize on that “chase card” market by being the first to randomly insert, into card packs, personally autographed and numbered cards of superstars. The chase card collectible was off and running. By 1991, over 3 million people were collecting baseball cards. Conventions were held every weekend, sometimes 3-5 at the same time in the same city! Adults were the big collectors of the time. Sales passed the $1billion mark and in the early 1990s, 81 billion cards were printed in a single year. That is a lot of cardboard! It was inevitable that it all came to a crashing halt, with the glut on the market, greed of both licensing entities and the companies who produced the cards. The last straw was an eight-month baseball strike in 1994. It was over for the sports card collectible market. It hasn’t recovered. Share the post "Variant Comics from then ’till now – Part 7!"